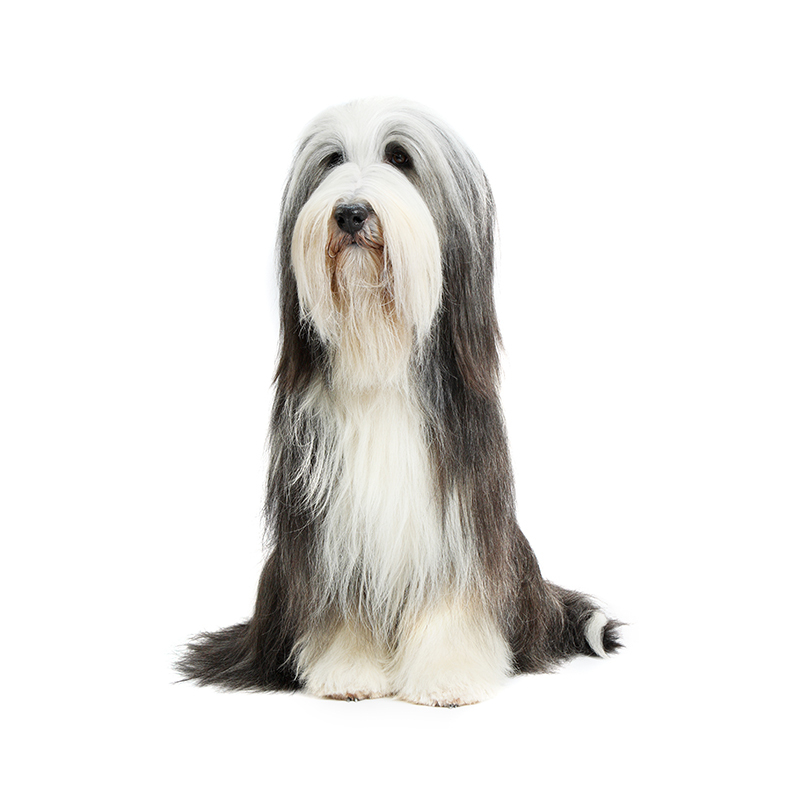 The Bearded Collie is one of the oldest breeds in Britain. He has gone by the names of Highland Collie, Mountain Collie, or the Hairy Mou’ed Collie. Shaggy herding dogs of this type existed for centuries as helpers to farmers. They were bred for working ability, but there were no records kept, so how the Beardie came to be is unknown. The speculation is that a Polish merchant visiting Scotland in the 1500s traded a pair of Polish Lowland Sheepdogs for other commodities. These dogs were probably crossed with local sheepdogs to develop what we know as the Bearded Collie. There are pictures of Beardies in portraits painted by Gainsborough and Reynolds in the 1700s. The breed was kept alive by shepherds who knew their working abilities and continued to use them in the field. Beardies first came to the US in the late 50s but were not bred until 1969. The Beardie is smart, resourceful, and confident. He has a bouncy, bubbly personality that makes him fun to be with, but when it comes to training, he can be a stubborn, independent thinker who likes to have his own way. He is a boisterous playmate for children, and his sense of humor makes him fun to be around. A well bred and well socialized Beardie puppy will be curious and playful, willing to approach people and be held by them. The description of a Beardie usually includes the following adjectives: enthusiastic, hardy, exuberant, active, energetic, bright, reliable, and trustworthy. He is known as the Beardie from the hair that hangs down from the chin and forms a beard. The Beardie is an indoor/outdoor dog. He needs to live inside with his people with access to a yard or fenced acreage where he can run. He is not usually suited to apartment life. They enjoy being with their people, whether they be indoors or out. They should be satisfied with a couple of half-hour walks or play sessions with a ball daily. The Beardie has a flat, harsh, strong, and shaggy outer coat and a soft, furry undercoat. The coat falls to either side naturally without need of a part. Long hair on the cheeks, lower lips and under the chin forms the beard from which comes his name. All Beardies are born black, blue, brown, or fawn, with or without white markings. Some carry a fading gene and the color lightens as they mature, darkening again slightly after one year of age. Grooming is important, as it is for every double coated dog. As they are shedding their puppy coat, it is important to keep them brushed so that loose hairs will not form mats and weekly after they get their adult coat. Care must be taken to prevent this breed from getting too heavy. Beardies need obedience training to curb some of their boisterous ways. They want to please you, but are likely to add their own touch if they just don’t see the point. They have been known to open cupboards and steal food and even eat television remotes. They will sometimes try to herd their family and have been known to nip at small children, trying to keep them in the herd.